A knight in shining armor is a perfect costume for little boys; they can carry a sword and shield while on the lookout for dragons to slay. Make a costume for Halloween instead of purchasing one. The most important item you need is silver spray paint; once that is on, the costume looks real. No knight is complete without chain mail. Real chain mail is heavy and expensive, but you can get by with making lightweight look-alike chain mail for a Halloween costume. Gather roughly 100 round, metal frozen juice can lids. You can use other can lids as well, but those tend to have sharp edges. Let your friends know well in advance to save their lids for you. Punch two holes near the edges on opposite sides of the can lids. Using thin wire, attach the lids together into a large rectangle with a hole in the middle for the head. When it's time to dress up, slip the chain mail over the head. Every knight needs a helmet to protect his face from a sword or dragon; make one for your knight using a plastic milk jug. Cut off the top with the spout, using scissors or a sharp craft knife. Cut a hole from the side of the jug where the handle is; you don't need the handle and this provides a place for your knight to see. Slip it over the head to see if the hole needs to be bigger; draw a line and remove the jug before cutting again. Spray paint the entire jug silver. 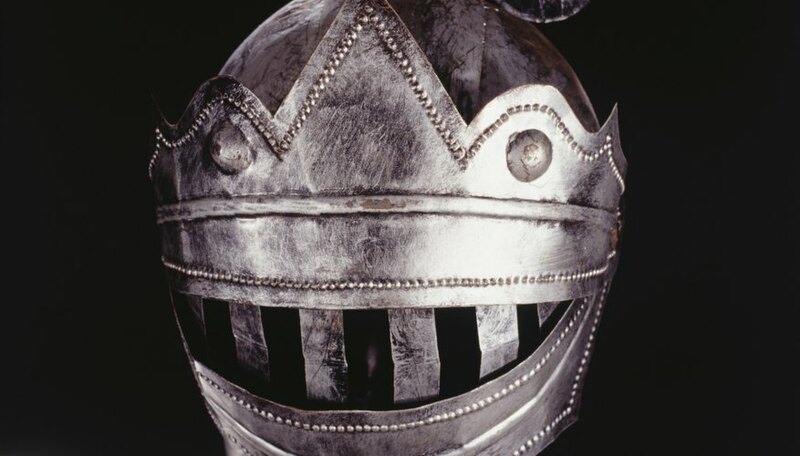 Knights typically made a lot of noise when walking around because their whole bodies were covered in metal armor. Although your knight won't be wearing metal armor, he still needs something that looks like it. Grey sweatpants and a sweatshirt can be worn to simulate armor. If that look isn't enough for you, cut a few tall cylindrical bottles vertically in half. Cleaning wipes containers are great for this project. They should fit nicely over arms and legs. Punch a hole on either side of the cut line and thread string through; tie the string around the leg or arm to hold the armor on. Spray paint all of it silver. No knight can slay a dragon or save a princess without a sword and shield. You can pick them up inexpensively at many dollar stores during the month of October. If you want to make one, cover a large plastic platter with tin foil; the shiny side should face out. A sword can be made from crumpled up tin foil, or cover a wooden sword or dowel with foil.